Some assembly is required and the assembled set dims = 89"W x 40"H x 34"D (82lbs). With a look befitting harbor towns, lighthouses and sandy beaches, the Classic Westport Chairs and Side Table are perfect for open-air entertaining. The Classic Westport Chair is the perfect assimilation of comfort and style. In fact, many find this to be the most comfortable of all flat-backed Adirondack chairs. The Classic Westport Side Table is the perfect companion to the Classic Westport Adirondack Chair or Classic Westport Rocking Chair. 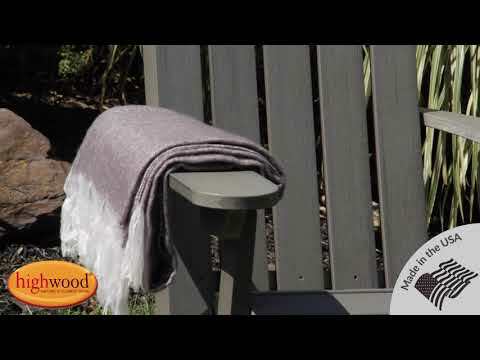 Best of all, Highwood material doesn’t absorb moisture and repels dirt and grime, making clean-up a breeze. The highwood® palette offers a wide variety of colors sure to embellish your piece of paradise. The chairs have been load-tested, per ASTM 1561-03 (2008) standard for Outdoor plastic furniture, and have a 500-pound weight capacity. Some assembly is required (see assembly guide) and assembled set dimensions = 89"W x 40"H x 34"D (82lbs). I love this set. The wood look is so realistic that you’d never guess they’re recycled plastic. Also super comfortable. Assembly time was about 50 minutes total.